blogging daily (and in today's case, thrice daily!) is very therapeutic for me - especially in this situation with the bugs. we've got the air mattress back up and dressed - with fresh sheets and cleanly dried pillows. i'm so tired, so looking forward to a sleep. we've got the comet ring around the mattress, i'm sprayed with DEET again (freshly showered in clean PJs). so i should be OK for the night. dear lord, keep us safe. i still feel a little creepy crawly, but there you go. 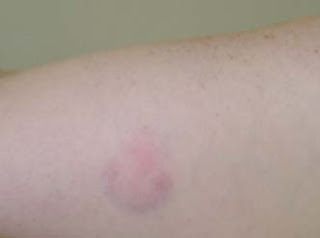 these are the images taken today - the bite/bruise/mark on my inner right arm - it's even more purple tonight. 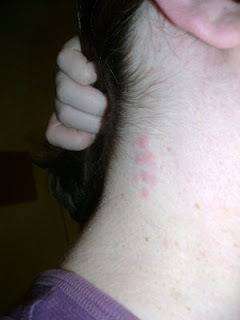 and then the marks on my neck - i just took this shot... i still hope these were from sunday night and not last night (when we were sleeping at Frank's). shawn washed Frank's sheets and checked his bed - didn't see any spots BUT Frank has brown sheets ... and I'm just overly paranoid, but I obviously got bitten in the last couple days. Oh man alive. This has got to end someday, right? Ready to run. Edit - it kind of looks like a Christmas tree shape, right?